Hello Kurma, can you tell me something about fenugreek. I’ve never used it. An erect annual herb of the bean family, indigenous to western Asia and south-eastern Europe, Fenugreek (Trigonella foenum-graecum) is cultivated for its seeds, which, although legumes, are used as a spice. The seeds are small, hard, yellowish-brown, smooth and oblong, about 3mm (1/8th inch) with a deep furrow across one corner. Fenugreek has a warm, slightly bitter taste, reminiscent of burnt sugar and maple. The seeds are used in Greece and Egypt and especially India, where they are lightly dry-roasted or fried to extract their characteristic flavour. One should note, however, that over-roasting or over-frying fenugreek results in an excessive bitter taste. Whn soaked overnight the seed coat beomes soft and jelly-like, and in this state it is one of the chief ingredients of a paste of bitter herbs called halba or hilbe, popular with people of middle-eastern origin. The leaves of the fenugreek plant are also popular in Indian cuisine. Known as methi, they are used in vegetable dishes, breads and savories. Easily home-grown, fresh young fenugreek leaves are wonderful in salads, dressed with oil and lemon. The young plants are used as a vegetable, being harvested when they are about 20cm (8 inches) high and tied in bundles like mint or parsley. Fenugreek can be sprouted, and the sprouts lend a pungent favour to salads. Fenugreek is famous as an ancient medicinal herb. American Indian women took the soaked seeds after childbirth to expedite healing. It was also renowned as a useful cure for constipation, as a powerful expectorant, and is today used in Europe as an herbal infusion to break up respiratory congestion. 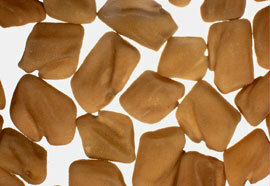 The seeds are a carminative (they relieve flatulence), and they are a useful treatment for diabetes. Fenugreek seeds are available at Indian or Middle Eastern grocers. The fresh leaves (if you are shopping outside India), can occasionally be found in markets or can be home-grown.